Following the success of Walking to Work, Simon asked us to get involved in a project he was doing for MADE (Midlands Architecture and the Designed Environment) in Birmingham. 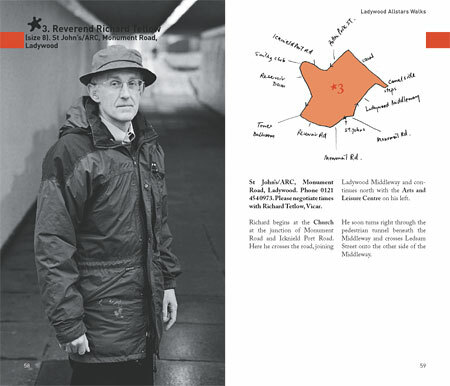 As part of the project, Simon wanted to publish a pocket-sized ‘walking guide’ to Ladywood, an area of inner city Birmingham where the skyline is dominated by tower blocks. The result is an 80 page guidebook which invites Ladywood residents and visitors to re-experience routes through and places in Ladywood, to see the area from another perspective. 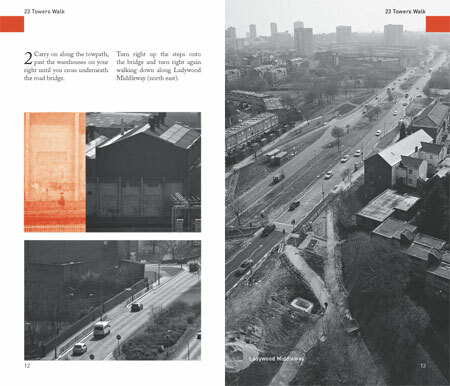 The book includes a walk seen from the perspectives of tower block residents, three walks guided by local holy men and a ‘lost’ walk which invites the walker to find steel cable ties engraved with quotes from local residents. Working with photographer Phil Martin, we again developed a distinctive approach to the project, using Simon’s handdrawn maps and Phil’s finely detailed and quietly humorous photographs to subtly contravene the conventions of the walking guide and as with Walking to Work, we were helped in tying down the finer details of the print process by Spectrum in Cardiff. 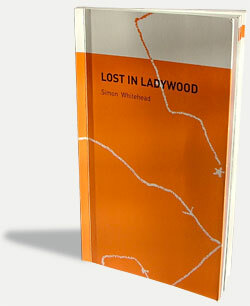 Lost in Ladywood by Simon Whitehead.